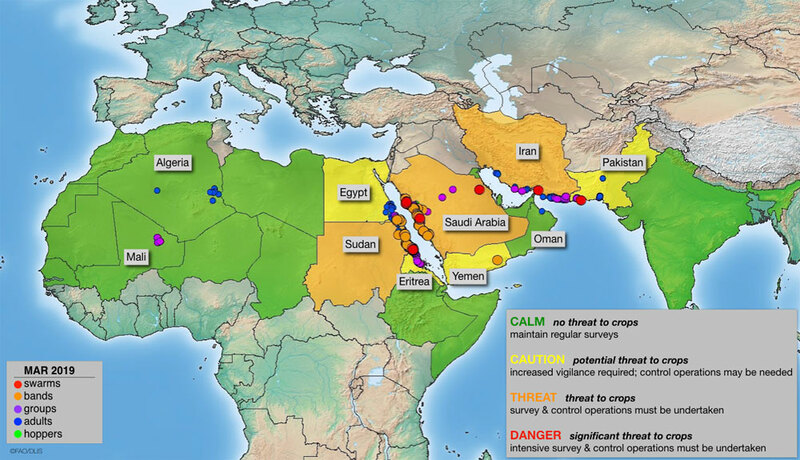 EghtesadOnline: Iran has been placed by the Food and Agriculture Organization of the United Nations in the group of countries where crops face the threat of desert locusts. Other countries placed in the same category are Sudan and Saudi Arabia, according to Financial Tribune. In Southwest Asia, adult groups and a few swarms are breeding on the southern coast of Iran and hatching commenced at the end of March. Adult groups and at least one swarm appeared in the adjacent areas of southwest Pakistan in mid-March where they laid eggs. Control operations were in progress in both countries. During April, locust numbers will decline along both sides of the Red Sea but will increase in the spring breeding areas in the interior of Saudi Arabia, and coastal and interior areas of southern Iran and southwest Pakistan where hatching will occur and hopper groups and bands are expected to form. Some of these could eventually form adult groups and perhaps a few small swarms by late May, reads FAO’s desert locust update published on April 3. FAO alerted Iran of probable locust attacks on Jan. 21, IRNA reported. The pest was first spotted in Hormozgan Province’s Bandar Lengeh on Jan. 4, according to the director of the Plant Protection Department of the province’s Agricultural Jihad Organization affiliated to the Ministry of Agriculture. “We have fought with swarms of locusts on over 12,364 hectares in Hormozgan up until April 9,” Hamid Dolati added. Saeed Moein Namini, an official with Iran’s Plant Protection Organization [PPO], says about 120 billion rials ($860,000) are needed to battle the pest. “The National Disaster Management Organization has agreed to allocate 100 billion rials ($715,000). Yet, the allocation of this sum awaits the approval of the Cabinet,” he said. The official added that the PPO has fought the hoppers on over 24,000 hectares of land s far, half of which has been in the southern province of Hormozgan. Namini further said Bushehr, Khuzestan, Sistan-Baluchestan, Fars, Southern Kerman and Qeshm Island are other areas where plagues of locust have threatened crops in Iran. The desert locust is among the most dangerous pests having the potential of destroying all greenery, including grains, fodder, vegetables, trees and even weeds on their path. The pest has attacked Iran’s farms two times before in the fiscals 1963-64 and 1993-94. The former caused heavy damage to the country’s farms and agricultural production. The desert locust is indigenous to Saudi Arabia, Morocco and the African countries and enters Iran by crossing from across the Persian Gulf.